This game is a sequel of \”Little Commander – World War II TD\”. The first generation of \”Little Commander” has been widely acclaimed and attracted more than ten million players globally. After another year’s thorough polishing, “Little Commander 2” is now back to the stage!! \”Little Commander 2 – Clash of Powers\” is a very strategic tower defense game. Players shall act as the commander of one of the three major powers in the game, aiming to choose different super weapons and strategies to clear up to 60 levels of defense missions. In this game, players may unlock and upgrade new towers continuously, install new modules for existing towers, and acquire Glory Stars to improve strategic points. This game supports both stand-alone mode and network mode. In the network mode, players can register for an account in order to challenge other players all over the world until climbing to the top of the rank! Download now and enjoy all pleasures a tower defense game can bring to you! Most importantly – it is absolutely free! ● Simple and convenient operation – drag-and-drop to place towers, slide to upgrade and sell towers, two-finger to zoom in/out battlefield map. ● 4 map themes, 60 levels for local game and countless network levels are waiting for you to challenge! ● World Contest mode – challenge the enemy countries and grab their territory, fight for your own country’s glory! ● Sky Ladder mode – challenge players all over the world and climb to the top of the chart! ● The commander strategy upgrading system – accumulate Glory Star to gain more strategic advantages. ● The military ranking system – defend enemy’s attack constantly to get promoted until 5-star General! ● 16 types of upgradable towers and coming more! – Laser tower, Sniper-gun tower, Landmine tower, Nuclear tower, and so on so forth. ● Three countries and 9 super weapons – you may release EMP bombs, biological weapons and even nuclear missiles! ● The tower modify system – challenge the maps to obtain modules for installing your towers! ● 13 smartly-designed enemy units. Resisting aggression and fighting for the glory of your country! Little commanders, are you ready to defense your territory? 【Little Commander – World War II TD】 – A TD game with very cute visual style. 【Soldiers of Glory : Modern War】 – A TD game that enemies could attack you back! 【Global Defense: Zombie War】 – Do you like killing zombies? Then you will like this defense game! 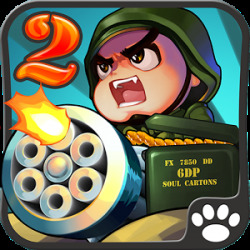 【Little Commander 2】 – the sequel of \”Little Commander – World War II TD\”, more towers, more fun! To Download Little Commander 2 For PC,users need to install an Android Emulator like Xeplayer.With Xeplayer,you can Download Little Commander 2 for PC version on your Windows 7,8,10 and Laptop. 4.Install Little Commander 2 for PC.Now you can play Little Commander 2 on PC.Have fun!